Thanks to our supermarkets and modern production methods, we have access to an incredibly wide range of fruits throughout the year. But fruit that is grown locally and in accordance with its natural season, picked when ripe and eaten soon after, is so much tastier and more nutritious than its mass-produced cousins. 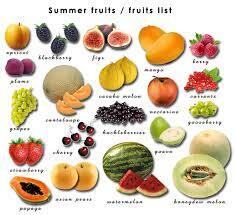 Summer in particular brings a wonderful range of delicious and nutritious fruits. Let’s have a closer look at some of these, and why it's worth getting your hands on them while you can! The most famous summer fruit is probably the strawberry. Strawberries are a fantastic source of vitamin C, providing almost 100% of our RDA per 100g, and are also a valuable source of manganese, a mineral that contributes to energy production and bone health. They are rich in anthocyanidins too, which give them their glorious red colour and work as antioxidants in our body. To top this off, strawberries are very low in calories, providing only 32 calories per 100g. Tip: Strawberries don’t have to be eaten with ice cream! Try adding a handful of fresh strawberries to any smoothie, slice them up to eat in a salad, or have them with plain yoghurt and a sprinkling of nuts or seeds. Raspberries come into season in late summer. Like strawberries, they contain lots of anthocyanidins but also a substance called ellagic acid, which is a potent antioxidant and may have specific immune-supporting properties. Raspberries’ content of these beneficial antioxidants is said to be much higher when they are picked and eaten ripe, so getting them from a local producer or farm shop is ideal. Eat them within two days of purchase. Tip: Fresh raspberries are also excellent in smoothies or with plain yoghurt. For the ultimate healthy dessert, a small handful of fresh raspberries with a few squares of very dark chocolate (85% cocoa) is divine, as the sharpness of the raspberries combines well with the bitterness of the chocolate. Apricots contain a very different range of nutrients to raspberries and strawberries. Their yellow-orange colour is a reflection of their content of carotenoids, including beta carotene that converts to vitamin A in the body; lutein, which is found in the macula of the eye and may support eye health; and lycopene that helps to look after our heart. They are also a good source of potassium, which is vital for healthy blood pressure. Tip: As well as in desserts, apricots can be used in savoury dishes such as chicken, rice or quinoa recipes or vegetable stews. Don’t forget the humble gooseberry! Gooseberries are another traditional British summer fruit, but they have become less popular in recent years. Even though they are not brightly or darkly coloured (a property associated with being high in antioxidants), they have a similar content of vitamin C and other essential vitamins and minerals to other summer fruits, and contain many similar antioxidants. Tip: As gooseberries can have quite a sharp flavour and their skins can be hairy, they are often best lightly cooked instead of eaten raw. They are excellent in crumbles and pies, and can also be made into sauces to accompany savoury dishes.